Lindsay Lohan: "I Regret The Choices That I've Made"
Tells Matt Lauer she still needs "to go through the process of proving myself"
Lindsay Lohan says she knows the best way to get her career moving forward is to "do what I'm supposed to do, and enjoy doing it, and do it as best as I can." Lindsay Lohan's been spending time at 30 Rock this week, preparing for her stint hosting "Saturday Night Live." But she found time to sit down with Matt Lauer of "Today," who asked her about her past, her future and the current state of her nightlife. During the candid conversation, Lohan admitted, "I regret the choices I've made," adding that her increasingly wild life was keeping her from pursuing her dream. "I'm not doing what I love to do," the 25-year-old told Lauer. "I like being on set and making films. I like talking about positive stuff." Lauer suggested that the actress had in the past been reticent to talk about certain things, a contention that Lohan acknowledged without reservation. 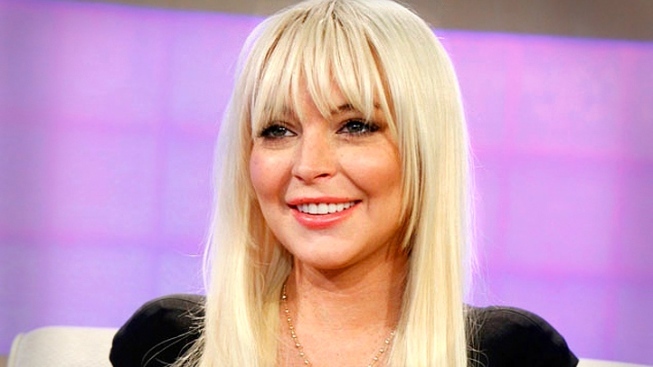 "It's a scary thing to have to kind of express to people," said Lohan. "I don't think I was—I wasn’t as comfortable with myself then. And yeah, definitely, though. I think it was a fear factor that I had about what was really going on. And, you know, I had to get that wakeup call." The "Today" host then asked Lindsay point blank if there were any people in her life that she trusted. Lohan replied "I trust my family," listing her mom, her sister, and her brothers. She pointedly did not mention her father, Michael, who has been in the middle of his own legal battles and scandals. Less than two years removed from Lohan's most recent visit to rehab, Lauer asked she could still enjoy going to clubs without surrendering to temptation. "I don't. I mean, I prob—I could, but I don't. That's not my thing anymore. I went out, actually, a few months ago with a friend. And I was so uncomfortable. Not because I felt tempted, just because it was just the same thing that it always was before. And it just wasn't fun for me. I've become more of a homebody. And I like that." Lohan went on to confirm rumors that her next film role will be Elizabeth Taylor, and insisted that she's determined to earn back the trust of people in film and TV. "I think that that's gonna take—I think that takes time. And I think that it's actions. Because people can say things all they want, but I think I still need to go through the process of proving myself, you know, with SNL, being on time, being, you know, keeping my—can't say the word, but—stuff together…I could see where it could be scary for people to invest in me. And I don't want people to have that reason to be scared anymore. So being able to have this opportunity with SNL and the film, I'm gonna do what I'm supposed to do, and enjoy doing it, and do it as best as I can." Lohan's already burned through second-, third- and fourth chances over the years, but her friendship with SNL goes back to before her dark days. If anyone can help her get back on track, it's the folks at Studio 8H.